This trick padlock offers a brain workout for puzzle and brain teaser lovers of any age. 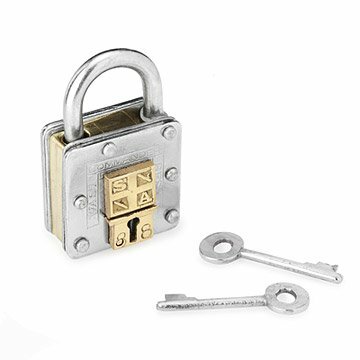 This devious puzzle is designed to look just like an old-fashioned, sturdy metal padlock, but woe to the poor innocent who tries to open it like one. Turn the key...and nothing happens. Nothing ever will happen, because it's a trick lock. The real "key" is a mental one: the solution to the trick, which you have to figure out. Puzzle locks have been around for centuries, foiling burglary attempts, keeping secrets, and helping escapologists (yep, a real word: we checked) baffle audiences. Feel like The Great Houdini, picking your own lock while honing fine motor skills, logic, and critical and imaginative thinking. Made in China. Game includes (1) lock and (2) keys. I thought this gift was perfect for the first 4 1/2 minutes and then it broke. The concept is great and my son really loved it but if you plan to open The lock more than twice don't waste your money. I ordered this as a gift for my puzzle loving brother. Sadly, I had to give him a picture of his gift. It arrived yesterday, a full year after ordering. I'm worried however because it looks like one of the keys has a piece metal on the side that looks like a flaw. I hope this darn thing works after waiting a year. Product is for alcohol. Marine friend loves it! This looked intriguing to my son, but he figured it out in a couple minutes. This was an excellent gift for my father who enjoys puzzles. My brother, sister and I figured it out before him and while it frustrated him, he really enjoyed the challenge.